Hello! I have just started to cultivate succulents and I think I have already made my first mistake. My laui got mealy bugs, so I went at my local gardening store and bought a bottle of pesticide. But after the first spray my plant lost almost all of the protective powder. Is there any chance it will restore the coating with time? And more importantly, are there any precautions I should take? 'Bloom' in this case means the powdery coating on the leaves. Usually, unless you get oil on them, or rub it off, this protects the foliage from intense sunlight. Indoors in a bright window or under lights, this isn't so important. Normally, with time and lots of patience, the bloom will restore itself, or the old leaves will gradually be replaced by new ones. The only precaution you need to take is not to expose the plant to bright sunlight because it will sunburn. I usually recommend using alcohol rather than some kind of oil based insecticide, as this doesn't affect the bloom. Alternately, look into a systemic pesticide if you find the mealy bugs coming back. This doesn't affect the outside of the plant. I don't have any recommendations for systemic types, but try to find one that says it's safe for succulents. 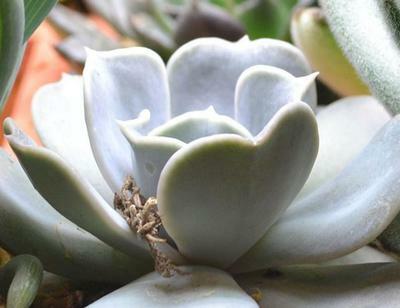 Mealy bugs are very common with succulents and can be difficult to eradicate. The mealy bugs often also infect the roots of the plant. They thrive in a warm dry environment. You could try taking the plant out of the pot, submerging it in soapy water and cleaning off the bugs with a Q-tip. Put the soil in a glass dish, moisten it, and microwave it, stirring a few times until it is steaming and heated through. This will kill the bugs in the soil.